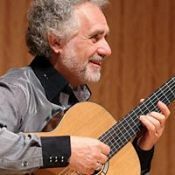 French guitarist, composer, conductor, and teacher, Jean Marie Raymond plays music spanning three centuries. Jean Marie RAYMOND was born in 1949. Guitarist, composer and teacher, he followed his musical studies at the prestigious "Ecole Normale de Paris" with Alberto Ponce and Javier Hinojosa. Also, he spent many summers studying with Maestro Emilio Pujol. He was awarded by a 1st Prize and obtained, as a teacher, a Diplôme dEtat and a Cerificat d'Aptitude. Ten years ago, he founded the french guitar magazine "Guitare Classique", which is the leader in that field. In 1977, he played as a solist under the direction of Seiji OAWA with the Orchestre de Paris. He produced a widely applauded recording (Guitare à quatre mains) with his Japanese friend Minoru Inagaki. He is now internationally touring as a soloist and with the Trio Sortilèges (flute, guitar, cello). Many of his compositions are published by Productions dOz, Quebec.